NOTE: this post has three parts. You have to read all three for a full understanding. Hope you get a kick out of it. Here is the remarkable email that came to me right out of the blue. And which made my day. Hello, I have recently found an article about my grandparents, parents, uncle and aunt. I have attached it. It has you, I believe, as the author. Could it have been a Worcester Telegram and Gazette article? Probably from the early 60’s since it mentions their approximate age and they were born in 1900 and 1901. Unfortunately my Grandparents didn’t save the date or what paper it was from. My parents bought the car mentioned in the article. I have many happy memories sleeping in it with my sister on family camping trips. After looking you up on the Internet this was probably one of your first jobs. You have lived a very interesting, energetic life! The old clipping she sent me. this page. It was one my weekly columns entitled “Camps and Camping” in the Worcester Sunday Telegram. I’ll tell you about that column and how it came about and how I produced it week after week. I think you’ll find it interesting. It will follow the column that Susan Bean sent me. We’ve had a delightful exchange of emails and even a nice telephone call. I call her Susan and she now calls me John. How about that? Susan getting two of her grandkids off to a good morning .just like when she was a little girl camping with her family.But no nice equipment like this back then. very fair man named Adna Cutting. His Hillcrest Farm was a showplace famous for its herd of Golden Guernseys. I loved that farm and its fine view. I approached Mr. Cutting and asked whether he’d sell me a house lot cut out of his farm. A new idea for him. He said yes. He surveyed out the choice acre I wanted and the next day put up barbed wire on three sides of it. And I built our home. I was 32. All those years those Golden Guernseys grazed on threee sides of us. I gave a young contractor named Joe Jakubowski the contract to put up the house.It was a conventional wooden house, or so it seemed. But the components were built in a factory. A totally new concept. I also used to write extra stories for the House and Home section in the Sunday Telegram. I was a busy fellow. I’d locate an interesting house, get to look it over and talk to the owner(s), take pictures inside and out, and write it all up. For extra money, of course. I wrote many. One day I spotted a nice one that turned out to be a Hilco Home–by the Hog Island Lumber Co. in Philadelphia, if I remember right. I was excited and told Pauline about it. The company offered a whole catalog of house plans. Also an architectural service. You could choose a floor plan and modify it and Hilco would send out new drawings for you to look over. No charge. I located other owners who had bought the model we favored. We interviewed them. And we bought a Hilco. We were saving a lot of money. Meanwhile, I had to have a foundation built. A big trailer truck delivered d all the sections to our lot. What an exciting day! Joe’s job was to assemble the components and rough-finish everything. I worked there after work many a night tarring the foundation, finish-screwing the sheetrock, painting the windows, on and on. Jobs that required not much skill but would help keep me in budget. Some things went wrong,of course, but I got the house built. I could have written a book called “John Goes Nuts Building His Dream House!” Everything said, it was one of my smarter moves. We added on over the years. Our three kids grew up there. By the way, Mr. Cutting never got around to selling any other parcel. Why am I telling you all this? Because of another remarkable coincidence. Susan’s Dad was a Hillcrest route salesman! She sent me a picture of him in his Hillcrest uniform. Today Susan and her family–hubby and two kids and four grandkids–live in New Hampshire. She is the general manager of four–maybe it’s six, I don’t recall–Dunkin Donuts shops. She’s on the road a lot–she called me from her car. They’re all still camping, now with a pop-out trailer plus a full travel trailer. When I asked for a photo of her, she was hard put. She chuckled, “I ‘m always the one taking the pictures!” But she managed to come up with the one you’re looking at. The George F. Jordans of 16 Palisades St., are convinced that no form of camping is as interesting as family camping. So far as they’re concerned, the more in the family, the better. Early this summer they took a camping trip to Emerald Lake, Vt., in company with three other families—two of them their sons’—and had a delightful time. They recently returned from a five-day campout at Acadia National Park in Maine with a son and his family. They had such a good time that they’ve started planning another trip. Both George and Helen Jordan are in their very early 60s, but they’re as willing to rough it as are their grandchildren. Their sedan has a front seat whose back lowers to make a bed, and the Jordans have come to appreciate this feature. They’ve used their sedan as a sleeper on several trips. She explained that “the camping bug seemed to come upon us naturally” three years ago after their son, George Jr., and his wife Roberta of 4 Marianna Ave., Auburn, have three children. And their son, Alan, and his wife, Phyllis, of 3 Bowker St.. Worcester, have two. When al o f them get together for a camping trip, they really fill out a big circle around the campfire. The Jordans have owned a summer cottage at Lake Manchaug 3 2 years, but despite the pleasures of lakeside living, they enjoy packing their gear and going on a long camping weekend now and then. They returned from their Acadia National Park trip glowing about the magnificent scenery of the Bar Harbor area and enthusiastic about the program. “Those rangers had nature walks that the younger people enjoyed very much including every other night community campfire programs at which they showed slides and led songfests. Marvelous! The Jordans learned that while they were there the park was accommodating 423 other camping families, but sites were far enough apart so that nobody felt cramped. Mrs. Jordan kept track of states represented at the campground by automobile plates and came up with a total of 28, including Texas, California and Alaska. 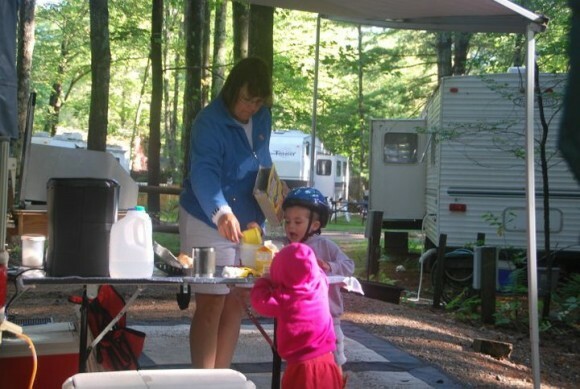 Many states publish listings of public campgrounds, but New Hampshire’s goes farther. It includes a detailed list of privately operated camping areas including directions to it, fees, and facilities and attractions, name of the owner, and other pertinent information. And here is how I got to write that column and some 500 others. A heap of words! Yes Susan, I wrote that column about your grandparents. It appeared in the Worcester Sunday Telegram in the early 60s, as you figured out. I do not remember the exact date. I had been a reporter for the Telegram and Gazette and now I was a staff writer on Feature Parade, the magazine of the Sunday Telegram. It was the paper’s own magazine, not a canned magazine that it bought from a syndicate and printed its own name on. Using local content is what made it so successful. Being a reporter on a daily paper is a tough job, very challenging, with hard working conditions. As a reporter for a morning paper, you got to work at 4 o’clock in the afternoon and might go home at midnight. My wife was a schoolteacher. Imagine that! And somebody had to cover on holidays and weekends. Pretty tough. But as a feature writer on the magazine I worked from Monday to Friday from 8 to 5. And most of the time I could to develop my own story ideas and follow through on them. Interesting personalities. Important events. It was a great job. In fact, in time I became editor of the magazine. So creative that some nights I couldn’t sleep thinking of new story ideas! I had heard about family camping. Knew nothing about it. In fact, had never been camping. I heard about a folding tent trailer – fantastically new at the time. Took my wife Pauline for a look at it. We rented it for a week. We had kids and were living on a budget. With stuff borrowed from home, we set off on a one-week trip to Shenandoah National Park. What a grand time! An adventure! It was fun, cheap, wholesome, and so affordable! We took to camping. I got the idea of writing a weekly column about all that and spoke to the managing editor – my top boss – of the Telegram. The Gazette had a separate staff. His name was Frank Murphy. Believe me, nobody ever called him Frank. It was always Mister Murphy. And I got started. I wrote it as a sideline on my own time. As I said, my job at Feature Parade ended at 5 o’clock on Friday. I would stay at my desk and write my column. I knew what it would be about and I had already interviewed somebody who might be featured in it. It would run not in the magazine, but in a section of the Sunday Telegram. It varied. Sometimes it would be about our own personal experiences on an outing. Sometimes about somebody like your grandparents. Sometimes about a trend in camping. And so on. I am pleased to tell you that it developed a wide readership. I had an annual two-week vacation. I persuaded my editor to let me take one month off in addition without pay. And Pauline and I set off with our two little kids – later we had a third – on an 11,000 mile trip to California and back. I had lined up interviews along the way, all with a Central Massachusetts angle. And I would stop for those interviews, take photos, pound out those stories on my little portable Olivetti and mail my stories and the photos – the undeveloped film – back to the Telegram. And it would all be published at the conventional freelancer’s payment rate. We also visited many national parks and monuments and I wrote those up as a special series in theTelegram. Well, I wrote that column for 10 years without missing a Sunday. One time, I was a hospital patient and I wrote the column from my hospital bed. Sure, I didn’t want to spoil my continuity record. Also I did not want to miss the $20 the Telegram would pay me for it. In fact, late in the game I took it upon myself to write a book about our family camping experiences. A very fine book, I thought, and was positive there would be a wide readership. Unfortunately I didn’t know anything about writing and publishing books and my book, well, that book, never got published. I still have the manuscript, by the way. And I was right. Family camping boomed. More and more new equipment got developed. More campgrounds sprang up, both public and private. It all became quite an industry. And even a big association came to life — the New England Family Camping Association. It held an annual convention and one year I was its guest speaker. I still have the plaque they gave me. Our kids grew up, life changed, and we gave up family camping.. You mention I have had quite a life. Yes, I have. For one thing, many adventures, lots of travel in the U.S. and abroad, many interesting personal encounters and I believe camping prepped me for all that. Let me repeat: I believe family camping is wonderfully good for any younger family. And older folks too, like your grandparents and parents. Thank you, Susan, for your email to me. Yes, it came out of the absolute blue. It has brought back many wonderful memories about those exciting l days. And thank you also for your looking me up online and contacting me. I’m impressed. Oh, I hope you and your family are camping. You mentioned you loved it with your grandparents and your parents and siblings. Of course! If you are not camping, it isn’t too late! I have written this far more deeply than I expected to. And it’s all your fault! Seriously, thank you for the opportunity.